Imagine a world where that Gnoll you killed in your last tabletop RPG had a life of his own. The dungeon’s just a day job—there’s a girlfriend waiting for him after a hard day’s gnolling. Want to know more about him outside of what loot he has when you whack him? Steve Lichman is the comic for you. Dan Warren and Dave Rapoza’s Steve Lichman follows the titular Steve, a skeletal Lich who’s both a high-up monster in a mysterious dungeon and a shoulder to cry on for the many monstrous denizens that also inhabit it. And although it’s not afraid to make a few knowing jokes in the direction of fantasy RPGs—like the above band of heartless adventurers slaying innocent dungeon creatures just to squabble over loot—it’s mostly about exploring what makes these classic creatures tick when they’re not rolling for initiative or what have you. You’ve got Steve, the hapless but helpful Lichlord serving as an advisor and friend. You’ve got Dracula, a totally vain bro who loves partying and doing drugs as much as being a creature of the night. There’s a mummy that also happens to be a nutty conspiracy theorist. In a wonderful merging of RPG trope-poking and character introspection, there’s also Jerry the demon, a boss creature who’s just entered his final boss form and is having a bit of an existential crisis. While the hook of Steve Lichman is that all of its character’s day jobs involve being dungeon monsters, that’s not really why you read it. 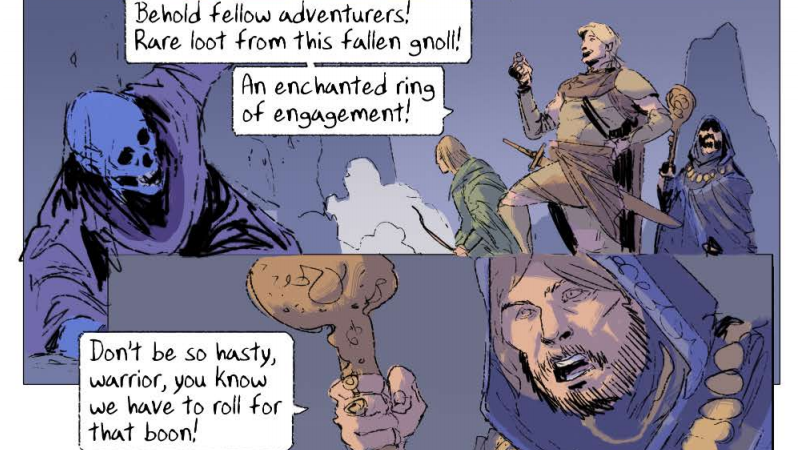 Rapoza and Warren’s real strength isn’t the fantasy trapping—though their past experience with series like Dungeons & Dragons or The Witcher does help in that regard—it’s the way they absolutely nail the casual banter between these fantastical trappings. Their conversations flow so naturally that the fact that the words are coming from the mouths of monsters is almost an afterthought. It’s a delightful absurdity to following the breakroom conversation about parties and video games when the conversants are a Gnoll, a Lich, a Mind Flayer and a Vampire. It’s that brilliant sort of banality mixed with fantasy that makes Steve Lichman so amusing to read. If you want to read more, Warren and Rapoza are currently running a Kickstarter to release the full first volume of Steve Lichman in a hardcover collection. It’s already more than funded, but you can still chip in for a copy or some extra rewards if you back it—the campaign ends tomorrow!